DBR UK consists of 3 artists, Craig Penman, Carl Nanton and Dan Myles. 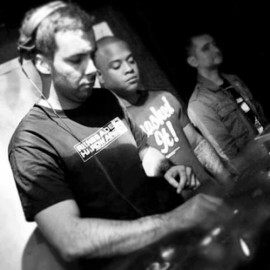 DBR have been together since 2001 and are known for their deep, minimal, stripped back style of production which has helped them generate over 40 tracks releases onto leading industry labels such as Dispatch, Renegade Hardware, Samurai Music, Ingredients & their own label Broken Audio. They have been DJ’ing Jungle / Drum and Bass since the mid 90’s and are known for their creative mixing style and versatile selection, maintaining energy in every setting. Over time they have witnessed the gradual fragmentation of the scene and, as more sub genres appeared, DBR remained focused on the deeper side of D&B. This is especially demonstrating this through their DJ sets, that retain true versatility by playing classic tunes for the Heads, but also selecting tracks that appeal to the less educated ears. This enables them to cater for all whilst still bringing fresh interest into this diverse scene. Regular DJ support coming from DBridge, Loxy, Skeptical, Dub Phizix, Ant TC1, Ink, Doc Scott, Bailey, Marcus Intalex, Ruffhouse, Klute, Ulterior Motive, Foreign Concept, Mikel, Raiden, Xtrah, Outrage, Dj Flight, Crissy Criss, Octane, DLR, Nymfo, Anile, Genotype, BTK & Many More. 1. Describe your music in less than 20 words? 2. What is the high point of your musical career to date? Releasing music on Dispatch, Renegade Hardware & getting to DJ over in Europe has to be our best points.